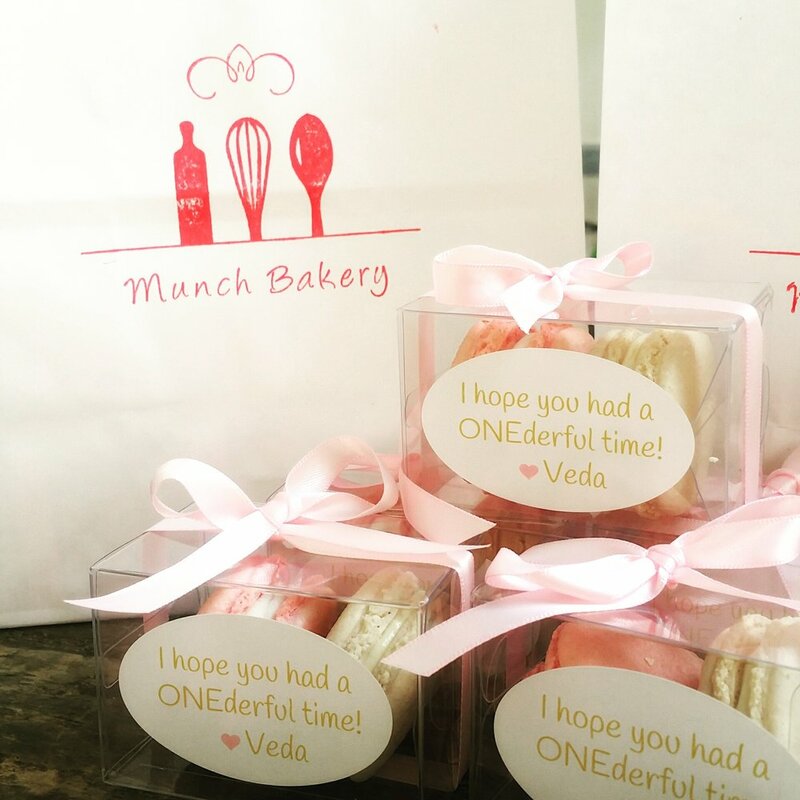 "Being a huge macaron fiend, I had Munch Bakery's macarons for my wedding. They were a big hit! Not only did I spend a good amount of time on the dance floor with macarons in my hand, people continuously asked me where I got them. The next year, I go to my friend's wedding, and surprise surprise...she ordered from Munch too!" "Munch Bakery is just amazing!! Mel's macarons are so beyond delicious and her flavors are so creative. You can tell each macaron is made with love and care and she provides an excellent end to end customer service experience. We ordered 6 dozen macarons for the candy station at our wedding and they were the first to be gobbled up! It was definitely the hit of the candy station. Thanks so much, Munch Bakery!!" "I ended up using some of the Filipino inspired flavors (Ube and Buko Pandan) for wedding favors because I wanted to incorporate a bit of culture, and guests loved them! I even gave swatches of my wedding colors to Melanie, and she was able to customize the macarons. They looked and tasted great!" "I am not a really big fan of sweets, but these macarons are amazing. Awesome and unique flavors that can go well with any meal! Love the earl grey tea (Just like Capt. Jean Luc Picard) Calamansi (Filipino Lime), Ube, Horchata and Salted Caramel. Melanie does a great job in explaining all the flavors so that who ever you are giving them to, will love them. She provided friendly and professional service. We got them as party favors for our wedding and they are a hit." Our gluten free macarons are all hand made at our commercial kitchen in Redondo Beach, CA. We make everything by scratch prioritizing flavor above anything else. There are over 30 flavors to choose from and custom colors are available upon request. Our cakes and cupcakes are all made to order and come in a variety of flavors ranging from Red Velvet to Mocha Chiffon. Our signature cake is the Rosette style with that simple elegance for any special occasion. Whether it's a wedding, engagement party, or a 1st birthday, the giveaways are always something your guests look forward to. Our party favors range from a simple two piece pack with a custom label or a more formal gift box with matching ribbon. We request at least 2 weeks in advance for catering orders. Contact us today to book your event!